This section is from the book "Applied Anatomy: The Construction Of The Human Body", by Gwilym G. Davis. Also available from Amazon: Applied anatomy: The construction of the human body. The axilla is a wedge-shaped space with its apex upward, formed between the arm and chest at their junction. It serves as a passage-way for the arteries, veins, nerves, and lymphatics passing between the trunk and the upper extremity. It is frequently the site of growths and abscesses, requiring operations which necessitate a knowledge especially of its blood-vessels and lymphatics. Its apex lies between the clavicle and scapula above and the first rib beneath. Its base is formed by the skin and fascia stretched between the anterior and posterior axillary folds. It is spoken of as having four walls: inner, outer, anterior, and posterior. The inner wall is formed by the first four ribs and interspaces and the corresponding serrations of the serratus anterior (magnus) muscle. The outer wall is nothing more than the chink formed by the union of the two axillary folds. Above is the lesser tuberosity of the humerus and subscapularis tendon, lower down are the coracobrachial and biceps muscles. The anterior wall is formed by the pectoralis major and minor muscles with the fascia enveloping them. The posterior wall is formed by the subscapularis above and the teres major and latissimus dorsi muscles below. The name axillary fascia is given to the fascia which closes the axillary space and forms its base. 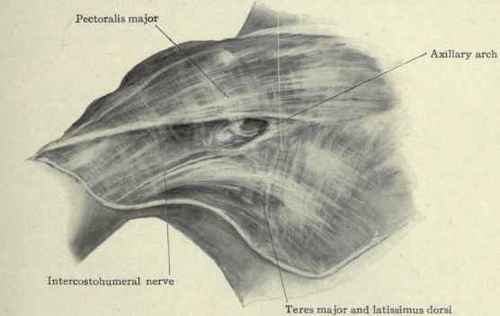 It is stretched across from the lower edge of the pectoralis major in front to the lower edge of the teres major and latissimus dorsi behind. On the inner wall it is continuous with the fascia covering the serratus anterior (magnus) and side of the chest; when it reaches the vessels at the apex of the axilla it is reflected around them to form the sheath. On the outer wall it passes from the pectoralis major in front, over the coraco-brachialis muscle beneath, blends with the sheath of the vessels, and then passes to the posterior wall, covering the subscapularis above and the teres major and latissimus dorsi below. At the lower edge of this latter muscle, which is a little lower than the pectoralis major, it passes across the axilla (Fig. 269). Anteriorly the fascia covers the pectoralis major muscle; at its lower edge it splits to cover the pectoralis minor muscle and forms a sheath for it. As the axillary fascia approaches the apex of the axilla where the superficial vessels enter, it becomes cribriform in character, the fascia itself being wide-meshed and containing fat in the interstices. If the handle of the scalpel is inserted in the apex of the axilla and worked backward and forward two arches of fascia are readily formed, one convex toward the chest, and called the "Achselbogen," and the other convex toward the arm, called the "Armbogen" (Langer, Oester. med. Woch., 1846, Nos. 15 and 16). The fascia on the superficial surface of the pectoralis minor is called the clavi-pectoral fascia. At the upper or inner border of the pectoralis minor it is continuous with the costocoracoid membrane which goes up to the clavicle, where it splits to enclose the subclavius muscle and to be attached to the anterior and posterior borders of the clavicle. The upper portion of this costocoracoid membrane is thickened and forms a firm band which runs from the coracoid process to the cartilage of the first rib, and is called the costocoracoid ligament. Between this ligament above and the upper edge of the pectoralis minor below, and piercing the costocoracoid membrane, are the acromiothoracic artery and vein, the cephalic vein, the superior thoracic artery, external anterior thoracic nerve, and a few lymphatics derived from the breast. The superior thoracic artery is often a branch of the acromiothoracic and passes behind the vein to supply the serratus anterior and intercostal muscles and side of the chest. The fascia on the under surface of the pectoralis minor unites with the layer on its upper surface, and passes upward to the coracoid process and is reflected onto the vessels to aid in forming their sheath. It is continuous with the fascia on the under surface of the subclavius muscle and the deep fascia of the neck. Fig. 269. - Axillary fascia. At the apex of the axilla the fascia is almost lacking, forming a curved arch on the side toward the chest, called the axillary arch or " Achselbogen." The curved edge toward the arm, less distinct than that toward the chest, is called the " Armbogen". This portion of the fascia is not sufficiently strong to form an absolute barrier between the neck and axilla, consequently abscesses forming in the neck will break through it and passing under the clavicle appear in the axilla, and abscesses starting in the axilla may burrow under the clavicle and up beneath the deep fascia of the neck.